Say what? You must mean that you will not be adding more to your national debt, because I know that I certainly won’t be adding to the national debt, so you need to take the we out of that statement buddy. The real question is how are you going to pay back the trillions of dollars that you have already squandered? And here’s another riddle – What will the U.S.A.’s gross domestic product (GDP) need grow to by the year 2016 in order to keep pace with the present White House occupant’s irrationally exuberant spending spree? And based on the answer to that question, at what annual rate must our economy grow? 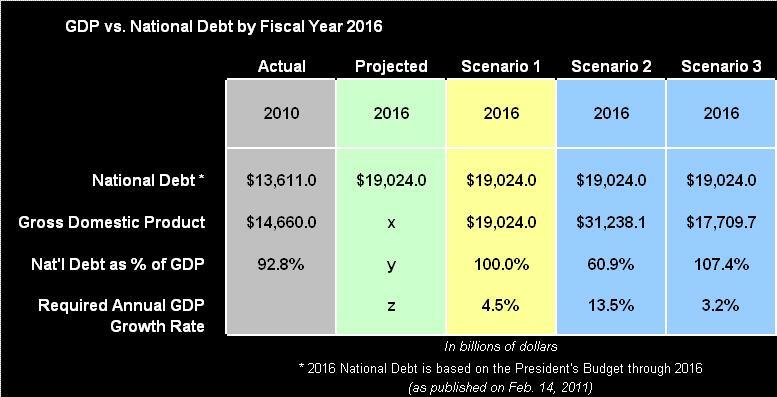 If we add the inexperienced CEO’s 2011 to 2016 projected annual budget deficits to fiscal year 2010’s ending national debt balance of $13.6 trillion, then the national debt will equal $19.0 trillion by the year 2016. And you call that “not adding more to the national debt”? So is this guy a pathological liar, or what? At the end of 2010, the Bureau of Economic Analysis (BEA) reported that gross domestic product (GDP) for the year was $14.6 trillion. So depending on the rate of economic growth over the next 6 years, the national debt may sooner or later exceed GDP. Although even the present White House occupant once stated that the national debt is unsustainable, the question is – as juxtaposed to what? If we take a look back to the days when our debt was sustainable, when the economy was growing at roughly 5% per year with low unemployment, such as in 2003, we will discover that the debt-to-GDP ratio back then was 60.9%. So the question is what do we need to do in order to reduce our debt-to-GDP ratio from its present level of 92.8% back down to 60.9%? In Scenario #1 (below) we will determine the rate of economic growth necessary in order for GDP to equal our projected debt by the year 2016. In Scenario #2 we will discover the rate of economic growth needed to return to a more healthy debt-to-GDP ratio of 60.9%. Finally, in Scenario #3 we reveal what the debt-to-GDP ratio will be by 2016 if GDP maintains its present growth rate of 3.2% per annum. Gross domestic product must grow from $14.6 to $19.0 trillion in order to equal the National Debt by 2016. In other words, GDP must maintain an average sustained growth rate of 4.5% per year, over the next 6 years, in order to achieve a debt-to-GDP ratio of 100%. This represents ‘the budget to nowhere’. Although, the Bureau of Economic Analysis reports that GDP grew at the rate of 3.2% in the 4th quarter of 2010, as you can deduce, this will not be sufficient to reach the current White House occupant’s pitiful goal of a 100% debt-to-GDP ratio. In order to return to the more prosperous 2003 debt-to-GDP ratio of 60.9%, GDP must grow at a sustained annual rate of 13.5% over the next 6 years. How likely is this? In order to achieve such a rate of growth, our economy would need to expand at the pace of an emerging market economy, a feat which is hardly doable. This is precisely why the Debt Commission recently stated that we will never grow our way out of this fiscal disaster. Finally, if GDP maintains the present annual growth rate of 3.2%, then our debt-to-GDP ratio will have reached 107.4% by 2016. Welcome to reality, and to a future of bonded labor. 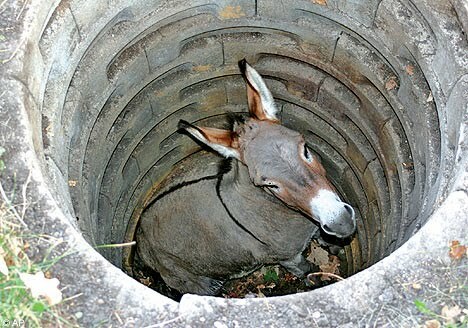 This doesn’t look like winning the future to me, it looks more like a donkey in a quagmire. The present White House occupant’s budget plan leads to disaster. What most of us wanted to hear was a plan for paying off the debt which he alone has run up over the last two years, not more debt evasion. Face it, there is only one way out of this mess. The first thing we need to do is to derail all of this administration’s reckless spending initiatives. Secondly, government spending must be cut, slashed, and cut again. And finally, we must get this fiscally bankrupt pathological liar out of the White House, by any means necessary. By any means necessary. And as far as who will be the next POTUS; throw a dart. While I am not certain about who it will be, I definitely know who will be packing up at the end of 2012, if not sooner.